Sold in sets of 50 for bulk purchasing. Crafted from a rigid, food-grade plastic, safe for use within food displays. 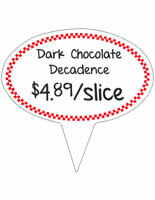 Designed for use with a deli sign card measuring 1/32" in thickness. Cafes, delis and seafood markets alike can benefit from the use of this pin tag holder. 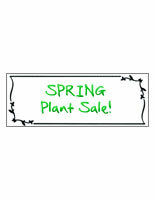 These sign picks feature wholesale pricing, ideal for food service locations needing to display many signs at once. This white plastic pin tag holder, like a signholder clip, acts as a badge display in cafes and coffee shops, prominently identifying the baking ingredients used for those customers with food allergies. Delis often stick these sign picks directly into bowls of freshly prepared salads, advertising the current price per pound. Seafood markets also insert the pin tag holder, that is made from plastic, directly into the fresh seafood to display pricing. White plastic picks are used by a variety of businesses, as this neutral coloring is sure to blend with any food display. Each pin tag holder will also coordinate with any sign card as well, for pairing together to make eye catching signage displays. 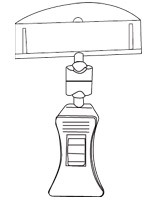 Each plastic pick is designed to hold a price badge measuring up to 1/32" in thickness. 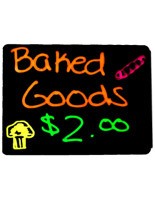 The deli signs sold on this website are the perfect addition to this pin tag holder that is sold in sets of 50. The use of rigid signage materials is strongly recommended, to prevent your badge from "flopping" over when on display. Each sign card clip, pin tag holder features a fork-like design. This prevents your deli badge from easily falling out of the plastic pick. 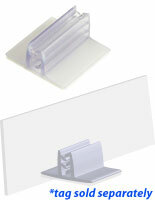 A pin tag holder that displays pricing is made from a rigid plastic. 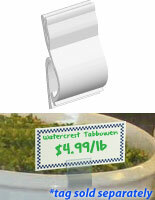 The material used is food-grade, safe for inserting directly into your displayed food items. By inserting a pin tag holder with a pricing badge into items in your service cases, customers are less likely to ask clerks pricing questions. As a result, store clerks are able to serve more patrons, increasing sales for your business location! 0.875" x 3.0" x 0.1875"